A good, solid industrial design will allow a product to last many decades in the marketplace without losing its appeal. While models can be tweaked and freshened on a periodic basis, the inherent goodness of the original product will still shine through. Lesser designs will come and go as fads relentlessly dictate, but successful designs will span generations of buyers. In our homes, products like Tupperware’s reusable containers, KitchenAid’s stand mixer and even Trojan’s condoms have been around for decades with little in the way of fundamental changes. Their colors, packaging and marketing have all varied with the times, but the basic design still rings true. Variations on the basic theme also go hand in hand with an intelligent design. Size is one variation that’s common on the market, since the one-size-fits-all strategy rarely works. Buyers have needs that can’t be met with just one size of plastic container, mixer or even prophylactic. The automotive marketplace behaves no differently when it comes to industrial designs. Innovative products are released, and in many cases the good designs lead to later variations. Getting it right the first time allowed several cars to enjoy long life spans, including the original Volkswagen Beetle, the Ford Model T and one of our favorites, the Mini. 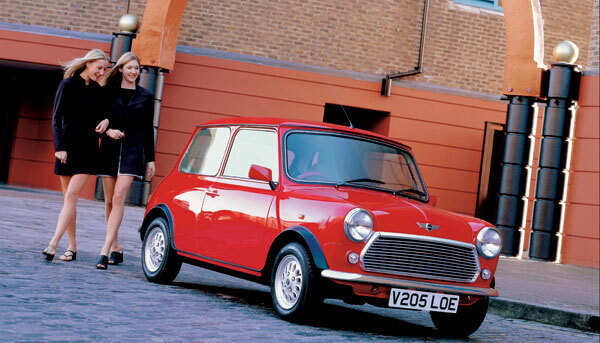 The Mini lasted for decades and spawned a nearly countless variation of models. In fact, more than 5 million Minis were produced during 41 years of production. That’s a lot of little cars. The man behind the Mini was a Turkish refugee named Alec Issigonis. His first major design was the Morris Minor, the British response to the Volkswagen Beetle. It was one of the most successful British cars ever produced, as about 2 million were built before it was phased out in 1971. Issigonis designed the Mini to meet the needs of a Europe threatened by the Suez Canal fuel crisis of 1956. The car’s small size, space-saving, transversely mounted engine and front-wheel-drive layout were revolutionary at the time, although they would become the industry standard for small cars within a decade. The Mini was penned with small 10-inch wheels at each corner of the 120-inch-long car. With a wheelbase of 80 inches, the Mini had very little front or rear overhang, thus reducing wasted space. It could hold four adults without their performing too much in the way of contortions, and there was even room for some luggage in the rear trunk. The fully independent suspension was a simple affair that used rubber cones as springs. This suspension design was designed by Alex Moulton and took up very little space—unfortunately, at the expense of ride comfort. On the plus side, it allowed for very little body roll, and the Mini’s go-kart-like handling was well received among enthusiasts. The original 848cc engine produced just 37 horsepower. Since it had less than 1400 pounds to push around, it was capable enough, propelling the Mini to a top speed of around 70 mph. It also delivered over 50 miles to the imperial gallon, cementing its success in fuel-starved Europe. 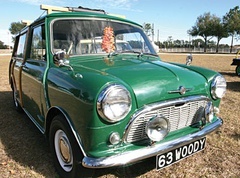 The Mini was released in August of 1959 as the Austin Seven and Morris Mini Minor, and quickly became a top seller. The two models would soon officially be renamed as the Austin Mini and Morris Mini; those names would be shortened to just Mini late in 1969. While the car sold well, it was never a moneymaker for the always-beleaguered BMC, the parent company of both Morris and Austin. In fact, the Mini was sold at a loss. Soon after the car was introduced, the upgrades and variants began to appear. The Van joined the lineup in January of 1960, while the Pick-up arrived on the scene a year later. In October 1961, the Mini theme was extended upmarket with the release of the Riley Elf and Wolseley Hornet models. The latter two models are easily distinguished by their distinctive grilles and rear end treatment—a small trunk was grafted onto the traditional Mini sedan shape. They also featured nicer interiors than the regular Minis. The parts that powered the car were also under a constant state of improvement. A larger 998cc engine—with 38 whopping horsepower—became standard for the Hornet models late in 1962. This engine would become an option for the Austin and Morris cars in 1964 packing 55 horses, and engine displacements of 1098 and 1275cc would eventually join the Mini lineup. By the end of the model run, it would even be fuel injected. The car’s suspension evolved as well. The original rubber cone suspension was replaced with a hydrolastic system in September 1964; like the rubber cone setup, the hydrolastic suspension was a product of the Moulton company. The hydrolastic design used fluid-filled assemblies that featured an internal rubber diaphragm that acted as a spring, like the earlier design. However, a series of valves controlled the movement of pressurized hydraulic fluid between the front and rear units on each side of the car. The movement of this ethylene glycol through the valves provided some of the traditional damping force of a shock absorber. This system added both cost and complexity to a car that was blessedly short of either; in retrospect, it wasn’t a great leap forward in reliability for the Mini. What is now commonly called the Mk I Mini was produced from 1959 to 1967. As time went by, BMC engineers tweaked a few odds and ends to keep the car updated instead of redesigning the entire thing. As such, the Mk II Mini featured a larger rear window and a redesigned front grille. It was built from 1967 though 1969. Unfortunately for American enthusiasts, there was not enough money in the budget to update the Mini to meet 1968 U.S. safety standards, so the Mini ceased to be exported to our shores. Production continued uninterrupted in England, however, and the Mk III was released late in 1969. It featured more extensive changes, including larger doors with concealed hinges and wind-up windows that replaced the earlier car’s sliding pieces. The suspension was also converted back to the original Moulton rubber cones to cut costs. Coopers retained hydroelastic suspensions until 1971. The Mini soldiered on until October of 2000, when the last one rolled off the line. By then, 5.3 million Minis had been produced worldwide. During its last days, the car was fuel injected and sold under the Rover nameplate, which was owned by BMW by that time. BMW sold off most of the Rover line, including the Rover nameplate, but kept the Mini badge for itself. This was used to launch the new MINI in 2002. Like other successful industrial designs, the Mini came in many variations, from bare-bones utilitarian to sports car fast. The beauty is that there is probably a Mini for almost any need out there—within reason, of course. Here are some of the more popular variants produced. Coopers: The Mini’s excellent handling and lightweight design caught the eye of Formula 1 car builder John Cooper. He took a stock Mini and developed a comprehensive set of engine, drivetrain and suspension changes to create the Mini Cooper, which was first sold in 1961. The engine was uprated from 36 horsepower to 55 by enlarging the stroke and reducing the bore for an increase in displacement to 997cc. Twin SU carburetors, bigger valves and a larger-diameter exhaust system were used to help the little engine breathe better. The compression ratio was increased from 8.3:1 to 9.0:1 to give the A-series engine a little more grunt. A host of other changes included 7-inch Lockheed disc brakes on the front wheels, shorter gear ratios and even a shorter gear change lever inside. New water temperature and oil pressure gauges were added to the central cluster on the dashboard, although oddly enough, a tachometer was not fitted. The even-hotter Cooper S first appeared in 1963, featuring a 1071cc version of the same A-series powerplant. In addition to the displacement increase, the engine also received larger intake valves, a nitrided crankshaft and even larger oil passageways for improved lubrication. The new engine developed 70 horsepower at a high-for-the-time 6200 rpm. The chassis was supplemented with larger front disc brakes, a sturdier clutch and upgraded transmission bearings as well as an option for wider wheels and tires. For 1964, the Cooper S was available with two different engines, a 970cc version for under-1-liter classes in Group 2 European Touring Car Championship racing, and a 1275cc version for international rally competition. The 970cc engine muscled out 65 horsepower at 6500 rpm, while the 1275cc version was good for 75 horsepower at 5800 rpm (and was also able to hold together up to 7200 rpm). That’s over twice the horsepower of the original 1959 Morris Mini Minor. While the 970cc version was only made to order and was subsequently dropped in 1965, the 1275cc Mini Cooper S became the car to beat in international rallies. It won the Monte Carlo rally three times: in 1964, 1965 and 1967. (For a complete story on the Mini’s victories in Monte Carlo, check out Issue 109 of Classic Motorsports.) In all, some 146,000 Mini Coopers were built, of which about 46,000 were the faster Cooper S models. They lasted until 1971, when John Cooper’s contract with British Leyland was terminated. Elves and Hornets: The Riley Elf and the Wolseley Hornet were two of the first real variations on the Mini theme. These nearly identical Mini-based cars featured a more classic front grille and a very small trunk. They were aimed upmarket of the “standard” Mini and never saw the same level of success. Approximately 30,000 examples of each model were produced from 1961 through 1969. Countrymen and Travellers: For those needing more room in their Mini, several long-wheelbase versions were produced. The Morris Mini Traveller and Austin Mini Countryman were built on a chassis that was 10cm longer than the standard Mini and featured double doors on the back. Fancy versions had wood inserts on the rear of the body, mimicking the look of the American Woody wagons of the 1950s. Around 207,000 Countrymen and Travellers were produced from 1961 through 1969. This car was only built for the British market. Vans and Pick-ups: The Mini Van was essentially a Traveller without any side windows. It was considered a commercial vehicle and as such carried no sales tax, making it even cheaper to own than a normal Mini. More than 500,000 Vans were produced between 1960 and 1982. A Pick-up variant of the Traveller was also produced during this same timeframe, although only 58,000 were manufactured. The Clubman and 1275GT: To update the Mini for the 1970s, a new front end was designed that provided better crash protection and increased underhood access while also giving the Mini a more modern look. The Clubman was designed as a replacement for the Elf and Hornet versions and was available alongside its round-nosed older brother. The 1275GT was built as a replacement for the Cooper S, and was the first Mini model to feature a tachometer. Despite the fact that these were considered more “modern,” the Clubman and 1275GT models were phased out in 1980 while the earlier, bulldog-nosed Mini soldiered on for another two decades. About 500,000 Clubmans, Clubman Estates (a Clubman-nosed Traveller) and 1275GTs were produced from 1969 to 1980. Mokes: The Mini Moke was originally designed as a Jeep-like light infantry vehicle for the British Army. Understandably, its low ground clearance ruled it out for wartime action. However, the Moke became very popular in tropical locations like the Caribbean and Polynesia as rental vehicles. The Moke’s even lighter chassis and minimal comfort items made the car extremely nimble. (We’ve seen them appear as unlikely competitors at autocrosses and hillclimbs.) About 50,000 Mokes were built from 1964 through 1989. Buying a Mini today is a lot like traipsing into a Baskin-Robbins, Ben & Jerry’s or Maggie Moo’s. (We’ll stop the list there, it’s making our stomachs rumble.) Like our favorite ice cream parlors, there’s a bunch of flavors available and they’re all so good that it’s hard to choose the right one. As the saying goes, “God don’t make no junk”—and you’d be hard-pressed to find a Mini or variant that isn’t a total hoot in some way or another. Like many of our readers, our editors have long pined to have a Mini in their own garage. We’ve driven and lusted after many, including the bright-red example that can be found parked in Carl Heideman’s shop. Hayes Harris, the proprietor of Wire Wheel Classic Sports Cars, has also tempted us by regularly featuring Minis in his showroom. In order to personally sample many of the different varieties produced, we figured we needed to organize a test day. We got in touch with Classic Minis of Florida through their circus ringleader, Mike Guido, to organize a meet at Ocala Gran Prix for photography and driving impressions. Mike, who is a clown in real life (really), helped us track down quite a variety of Minis to play with and compare. Our final lineup included 10 different Minis ranging from a Woody Traveller to a genuine Cooper S. Once we had finished putting them through their paces on our mini-road course, we were left with an equally wide range of impressions, matched only by the grins on our faces. Robert and Donna Parlaman have owned their 1960 Morris Mini Minor for more than 10 years now. During that time they’ve performed a restoration and repainted the car its original colors, Island Blue with a Old English White roof. The original seats were reupholstered in a modern vinyl, while seat belts and a wood dash and door trim were added for an extra bit of shine. During the restoration, the original 848cc engine was replaced with a 998cc version for a little more oomph, but otherwise the car is in very stock condition. The tires are Kumho Power Star 758s in a 145/80R10 size. This original Mini is the essence of simplicity. As you climb in, you notice that the door pulls are simple cables and the car has a light and airy feeling to it. The vinyl seats and wood dash are the only noticeable changes to the car’s original appearance. The early Mini is simple and easy to operate, and once you’re familiar with the very few items you need to control the car (like finding the floor-mounted starter), you’re off and running. The long shifter and somewhat imprecise shift pattern take some getting used to, but the car moves out well and you quickly get the sensation of speed. Turning the car into a corner, you notice the large, thin-rimmed steering wheel and imagine you’re in the world’s smallest city bus. The car turns as if it’s actually traveling around the axis of that steering wheel and, with no hesitation, you’re off in a new direction. The drum brakes on our test car were well adjusted and they pulled it to a stop with little effort. We noticed that even with the stock suspension and basic tires, we were sliding around on the vinyl seats, making the seat belts a welcome addition. Rick Brown is a retired banker who survived the Sept. 11th attacks despite having an office at the World Trade Center. Soon after, Rick moved to Florida and started looking for a Mini to have fun with. He purchased this 1973 Mini in 2005 and within a month drove it to Ohio for the Mini Meet East. He was awarded first in class in the car show. He then drove it to Ottawa, Canada, and back down into the States via Michigan. During the drive back, he stopped off in Mackinaw City, Mich., where the Harvest Gold Mini took first place in the Other British class at an MGA meet. Rick’s Mini was repainted in the original color, but beyond that, the car is amazingly and refreshingly original. Where many Minis have been futzed with at some point or another, a majority of the fasteners on this car have never been apart. While some of the other Minis were faster and handled better, Rick’s car gave us the biggest grin. It’s delightfully original with just a touch of warm patina; just an honestly good car. The low mileage and original condition meant that everything was still tight and the car felt very solid. This Mk III Mini has the roll-up windows and the ignition switch on the dashboard. While some of the early-car enthusiasts decry these touches as too modern, we felt that they made the car feel a little more real and useable on a daily basis. Thumbs-up for this gloriously ’70s color shade as well. Corky’s 1967 Mini Cooper S is the real deal, a 1275cc version that he bought about three years ago. The engine and drivetrain are largely stock, with the addition of a free-flowing exhaust and a Weber carburetor conversion. The wheels were replaced with Minilites and wider 165/70R10 Falken FK-07E tires. The interior of the car has been updated with a pair of John Cooper seats and retractable seat belts, as well as a custom 10-inch steering wheel. It was repainted the original (and very rare) color, Fiesta Yellow, which has earned it the nickname Buttercup among Corky’s friends in his Florida-based club. Right off the bat, we noticed that the Cooper S had considerably more pull coming out of corners than the smaller-engined varieties. Only a slight hesitation due to a fuel pickup issue in the carburetor let the car down on a spirited drive. The small steering wheel increased the amount of muscle needed to turn the car, but it was easy enough, even without power steering. The brakes on this Mini were a little finicky, pulling to one side under harder stabs to the pedal. Interestingly enough, although this was the only Cooper S--the car that originally put disc brakes on the Mini--it had some of the weaker binders of the bunch. The Morris Mini Traveller gets a lot of attention, even for a Mini. This particular example is even more of a head-turner because Mike and Rhonnie Guido have added an oak rack for surfboards, making this the perfect three-quarter-scale Woody beach cruiser. The Guidos use their Woody regularly, attending shows around the Southeast and even traveling on a weekly basis to their favorite surfing spots. They've owned the Traveller for about three years, and besides the aforementioned surfboard rack addition, very little has been done to this 848cc gem, other than waxing. Mike's free time is largely taken up by his other Mini, a turbocharged terror, as well as his various Grassroots Motorsports $2006 Challenge cars, so this trouble-free Traveller only occasionally sees the inside of his shop. Mike smirks, "Well, at least it doesn't leak oil... well, never mind." Like the 1960 Morris Mini Minor, this early Traveller has a non-synchromesh first gear, requiring the driver to move the lever into second before moving it into first. Once this becomes a habit, the car is easy as pie to cruise in. And by cruise, we mean leisurely, as the Traveller is one of the heavier Mini models available, so the 36 horsepower, 848cc engine struggles to make it to 65 mph. The longer wheelbase is noticeable in turns, as the Traveller doesn't feel as much like a go-kart as the regular-length Mini does. The car turns well, it just doesn't turn as quickly. That shortcoming is made up for by the extra storage room for luggage, gear and whatever else you pick up at the beach. This Mini has been improved somewhat with a 1275cc engine and front disc brakes. The 12-inch Minilites are wrapped in modern 165/60R12 Falken FK-06G tires. Like the Traveller, the Pick-up has a longer wheelbase that makes turning a little less direct, but the car (truck?) handles very well, even by modern standards. The 1275cc engine makes this Mini much more adept in traffic, and certainly able to merge onto interstates with less fear and anxiety. The extra storage capacity in the back isn't great by half-ton standards, but it can haul bags of mulch or even a bicycle or two with ease. Melanie Jardine is the wife of Dion Jardine, owner of DJ Minis, a dealership that specializes in the original Mini. When Melanie said she wanted a more modern Mini as a daily driver, they found her a Rover Mini that was left-hand-drive. Oddly enough, they converted it to right-hand drive. "I wanted it to be like an English car, so I changed it and I love it," Melanie passionately exclaims. The car was rebodied as a 1967, which is how the Jardines' Mini is registered in the U.S. This Rover Mini is the most modern of the original tykes, with a fuel-injected 1275cc engine, a leather interior and even a modern dashboard. Melanie and Dion replaced the factory cylinder head with a Stage 3 head from DJ Minis, while a Playmini exhaust takes care of the spent fumes. While the basic seating position remains very similar to that found in the earlier Minis, the Rover version, with its modern dashboard and interior, takes some getting used to. This Mini is a lot like one of those houses that you see transformed on "Trading Spaces:" the original structure is still there, there's just a whole different look to it. The Rover Mini was clearly the fastest of the original Minis we sampled, and the work done to our test car's cylinder head was immediately obvious as this car revved cleanly to its 7000 rpm redline. The handling and brakes were all topnotch, with little dilution of the original Mini concept despite its plethora of changes and slightly increased weight. While the Rover Mini weighed close to 300 pounds more than the original Morris Mini Minor, it was flush with 2.5 times more power and better brakes. It's no wonder that these cars sold well into the new millennium. While they don't have the refinement of a Toyota Echo, they're certainly a boatload cooler. Werner Meyer's Mini is a common sight around our Ormond Beach, Fla., hometown, as it's often parked out front of our local AutoZone, where Werner works as a parts manager. Red, as he's known, has owned the car for 11 years and describes its primary use simply as "fun." Red has upgraded the once-slow Mk I Mini with a 1275cc engine, but it still stops with the original drum brakes. A set of Hella 500 driving lights are mounted in the grille, while smaller fogs are nestled in indentations in the aftermarket front air dam. Red's Austin is a great example of why the Mini has remained popular for so many years. Like the original Volkswagen Beetle, it's a wonderful canvas to work with. The light metallic blue paint is accentuated with a white roof and hand-painted pin striping. The interior has been updated with more modern seats, stereo and carpeting. Touches like these make you realize that Minis aren't just an enthusiast's type of car, they are a lifestyle in and of themselves. This Mini was not as quick as the Cooper or later Rover Mini, as its 1275cc engine breathes through the original single SU carburetor. Its original drum brakes were a bit touchy, but the Yokohama A008 175/60R10 tires did their best to give the Mini leech-like grip in the twisties. Once you purchase a Mini, you may have a hard time ever selling it. Just ask Joe Schott, who has owned his 1960 Austin Mini for 25 years. In that quarter of a century he has built a high-performance 1380cc engine with twin SUs, a Kent 286 camshaft and trick 1.5:1 roller rockers. Underneath, a set of adjustable Spax dampers and a lowered suspension with adjustable front and rear camber help the super-sticky Yokohama A032R tires grab the road. This Mini has been uprated with disc brakes in the front, and Joe likes to use Mintex pads and silicone brake fluid. Inside the little cabin, seats from a Honda Civic are mounted to the floor, with a Mountney steering wheel out in front. This particular Mini is left-hand drive and while not as quaint as the RHD versions, it does make driving a little more intuitive for drivers on this continent. From the blat of the sport-tuned exhaust to the growl of the race-compound tires, it was pretty clear that this Mini meant business. It was quick and undoubtably the best handling of the bunch, allowing the driver to carry speed through the corners like a formula car. We found ourselves forgetting to breathe during our lapping session, as the experience was so engrossing. It's little, but Joe Schott's Mini packs a big wallop. Robert Overdorff brought along his newest Mini purchase, a 1967 Moke that he bought just one month before our test day. It's got the stock 848cc engine, single SU carburetor and the factory drum brakes. The only concession to the modern world is a set of Kumho tires, 145/80R10s that are mounted on the stock wheels. Driving a Mini isn't like any other automotive experience; it has a feel unlike any other. The Moke is still more different. First off, you don't climb into a Moke, you climb onto it. Imagine sitting down on a front-engine golf cart, and you get the general idea. The gauges are minimal, with just a speedometer and a few idiot lights, while the basic plastic steering wheel has an industrial feel to it. Once the Moke is underway, the power is quite adequate; even with the smallest engine, our test vehicle had enough power for its lightweight chassis. The high windshield kept the wind buffeting from being annoying, but we'd be hesitant to drive the Moke much over 40 or 50 mph. It's more of a toodle-around type of vehicle--preferably in an area without gargantuan SUVs blotting out the sun. The Moke's handling is what caught us off-guard. Turn the steering wheel, and the car will go exactly where you want to go. It simply can't go fast enough to run out of traction in a turn. We actually started sliding out of the vehicle under hard cornering, as the painted steel seats offered little friction for our butts. We found ourselves leaning into corners (and out of the Moke) as we cornered, like a kart or motorcycle racer. It's no wonder that these unlikely buggers were used for amateur racing. Dion has owned this particular Moke for five years, and its tropical origins are pretty obvious: it's painted bright-blue with an eye-scorching shade of yellow on the bumpers and full roll cage. Completing the United Colors of Benetton look, the high-back seats are bright-red with a contrasting front grille. Even the steering wheel matches, as it's a Benetton-designed Momo piece. Under the hood, a 1098cc engine provides more than ample acceleration, while a set of disc brakes up front help slow the car. Wheels are 12-inch Minilite copies, while the tires are a tall and narrow Pirelli P3000 in a 145/70R12 size. 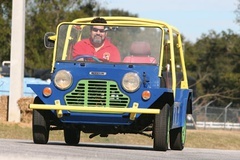 Like Robert's Moke, this colorful example provided a unique driving experience. With even more power, the little guy can really scoot around. The Mokeness of this particular car is somewhat reduced, what with the full roll cage and the real high-backed seats. It's still a simple, fun vehicle that would make a great addition to a vacationer's second home or even as daily transportation in a small town. As long as it wasn't raining, sleeting, snowing, drizzling, hailing—well, you get the point. By the end of our test day, we had driven 45 years' worth of Minis, both new and old. We were sunburned and a little tired, but it was the kind of tired one gets after a great day at the beach. If we had to choose a Mini from this bunch, we'd be hard-pressed to pass over Rick Brown's Mini 1000. This car wasn't the fastest, nor did it handle the best. It was, however, one pretty and delightfully original car. A 1973 model, Rick's car is a Mk III version, which means it's complete with roll-up windows and a few other modern touches that we appreciate; at the same time, it still retains the Mini's classic character. The added bonus is that the values of the mid-'70s 1000 models are still quite reasonable, so one can fairly easily find them selling for half the price of earlier Coopers. While the Mini 1000s are not as collectible, they do offer a great way to get into the Mini lifestyle and all of its grins.